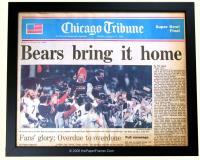 thePaperFramer.com can provide you with quality, custom made newspaper frames for your collectible newspapers. And unlike other sites that charge hundreds of dollars for a frame for your newspaper, the frames from me are very affordable. 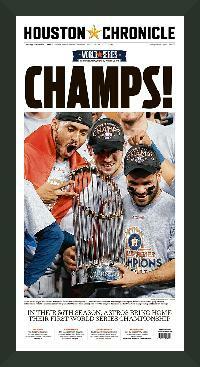 My value frames start at $44.95 for a full page (about 11" x 22") newspaper. 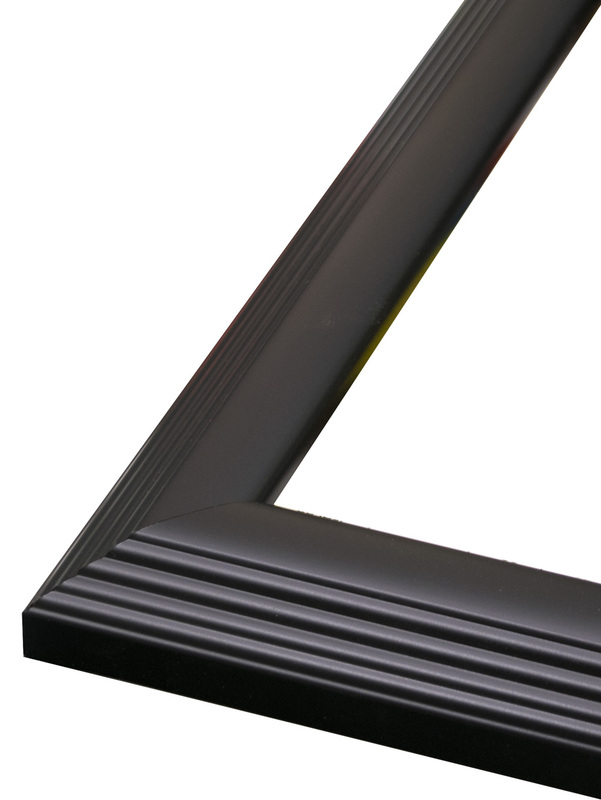 You have your choice of any of my mouldings for yourframe. Your frame is custom made to the exact size of your newspaper. Changeable Frames start at $90.95. Important. Newspapers come in many different sizes. It is very important the you measure your newspaper before ordering. For example, The current NY Times is 12"x22". The current Washington Post is 12 1/2" x 22". 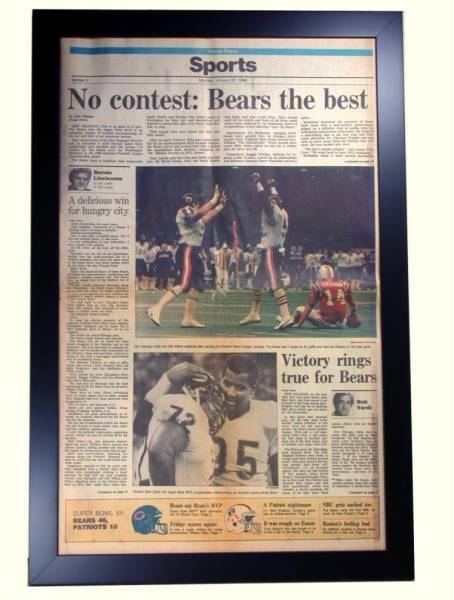 The current Chicago Tribune, Houston Chronicle, Philadelphia Inquirer and San Fransisco Chronicle are 11" x 22". Older newspapers are larger. Many in the 90s were 13-14" wide. 15" prevailed in the 60s and in the 40s and earlier 16-18" wide papers were normal. Some common current newspaper sizes are listed below. Measure carefully. The sizes listed below are not	guaranteed. Some newspapers such as USA Today and the Wall Street Journal are printed	at more than one location and the sizes printed are not consistent. USA Today 12" x 22" Check carefully. Size may vary. Wall Street Journal 12" x 22 3/4". Check carefully. Sizes may vary. 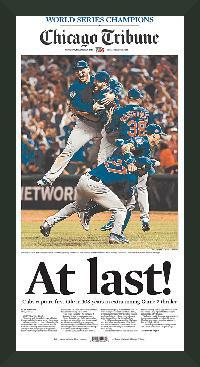 New York Times 12" x 22"
Chicago Tribune 11" x 21". 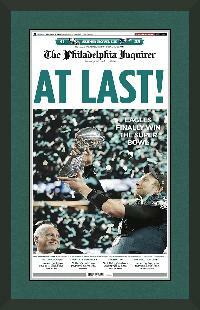 Philadelphia Inquirer 11" x 21". SF Chronicle 11" x 21". Check carefully. Size may vary. Washington Post 12 1/2" x 22"
Boston Post 12" x 22"
New Orleans Times Picayune 12 1/2" x 22"
While the frames below are my most popular for framing newspapers, you can use any of my other mouldings as well. 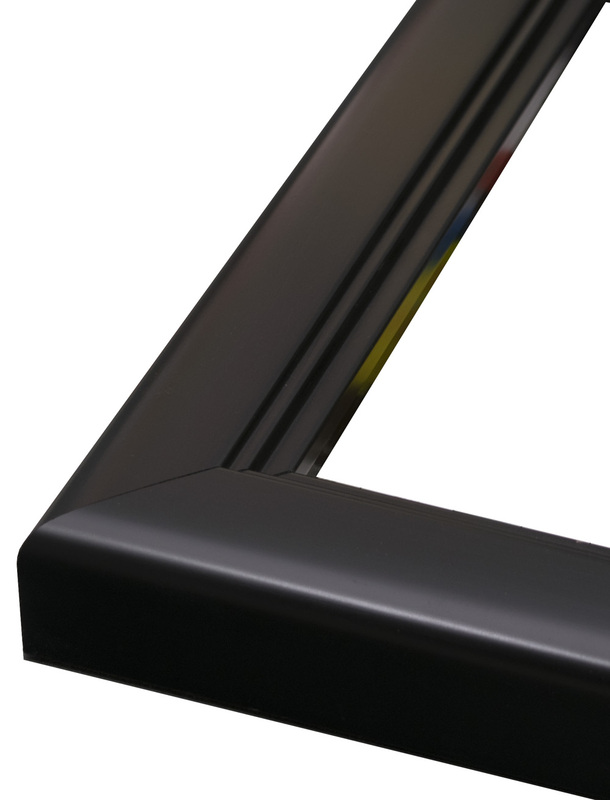 Click the 'Order' button below any frame to configure it for your newspaper and order your frame. Moulding 203, Matte Black 1 1/8"
This is a simple flat black 1 3/16" moulding that will work well with just about newspaper. It's my most popular frame for newspapers. It's $49.95 for a full size paper. Moulding 691, Opaque Black 1 3/8"
This is a very nice stepped opaque black 1 3/8" moulding that will work well with any newspaper. It's $69.95 for a full size paper. 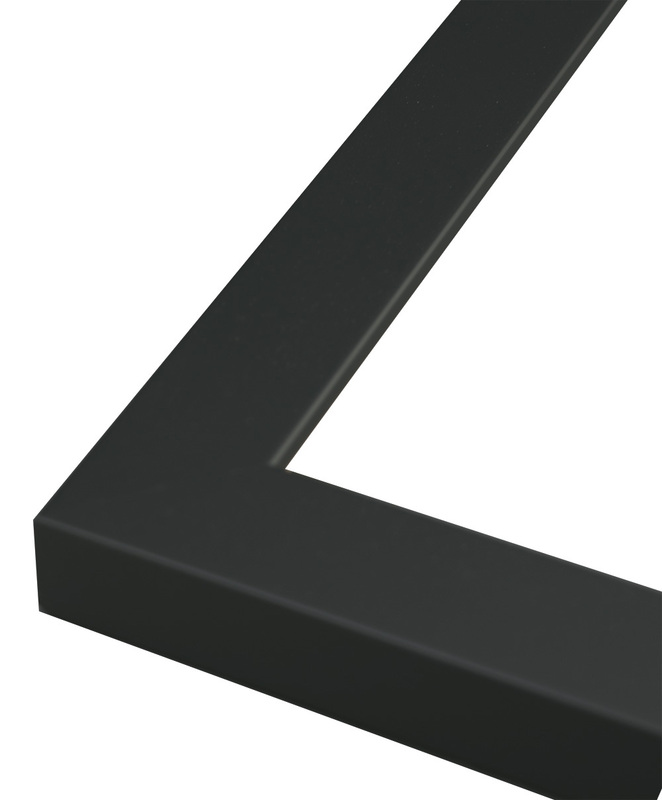 Moulding 803, Matte Black 1 1/8"
This is a stepped black 1 1/8" moulding that will work well with just about any newspaper. It's $56.95 for a full size paper. Moulding 301, Mattte Black w/Edge 7/8"
This is a very nice matte black 7/8" moulding with a beveled edge that will work well with any newspaper. It's $48.95 for a full size paper. There are several things to consider when framing your newspaper These included newspaper sizes, how much of your newspaper to frame, conservation and value or changeable framing. How much of my newspaper should I put in the frame? You can put as much as the frame will hold or as little as just the front page. Keep in mind that each frame has a limit of how much it will hold. For the frames above, #203 and #207 will hold a paper up to 5/16" thick for a Value Frame. Frame #601 will hold up to 3/8". That being said, there is another consideration and that is how "square" the newspaper is. Magazines and comics have square edges; newspapers do not. Take a look at the bottom three images on this page. See how "unsquare" the corners are. If you put this entire paper into the frame, the presentation won't be optimal because the paper probably won't sit properly in the frame. It most likely will be little crooked. The best presentation is achieved when only the front page or front section is put into the frame. Even then, you may have to refold the paper to get the front page "square". 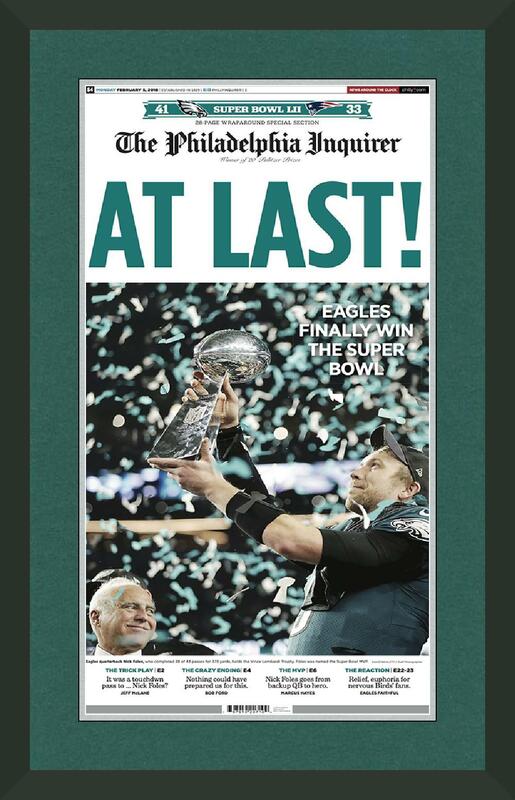 Our recommendation, put just the front page or front section into the frame and save the rest of the paper elsewhere. Changeable Frames for Newspapers. 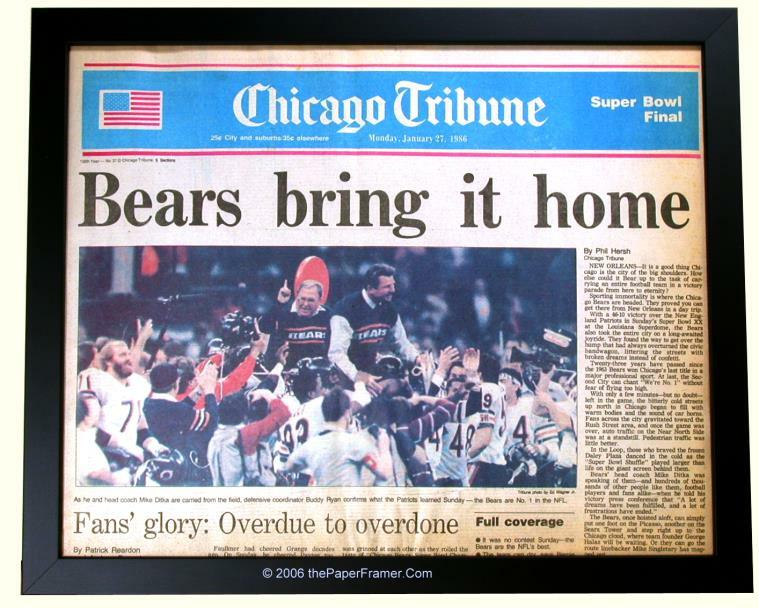 If your newspaper is valuable, you chould consider changeable framing. 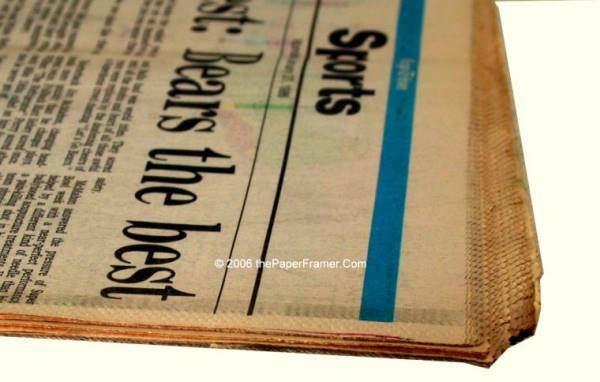 The mylar sleeve that comes with your frame provides the highest level of conservation protection for your newspaper. The only other consideration for a valuable newspaper is deacidification. You can read more on conservation here . Changeable framing is alsoIf you would like your newspaper matted, you should also choose a Changeable Frame. 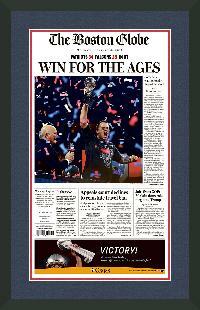 Value Frames for Newspapers. 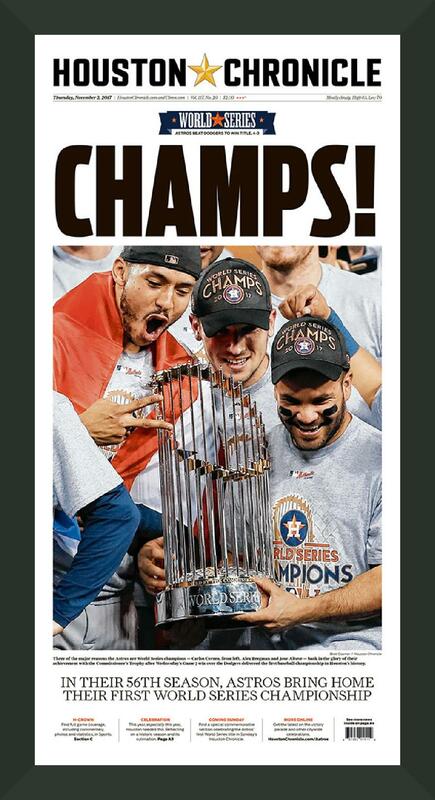 You should choose a Value Frame for your newspaper if you want the best value or don't want to mat your newspaper. 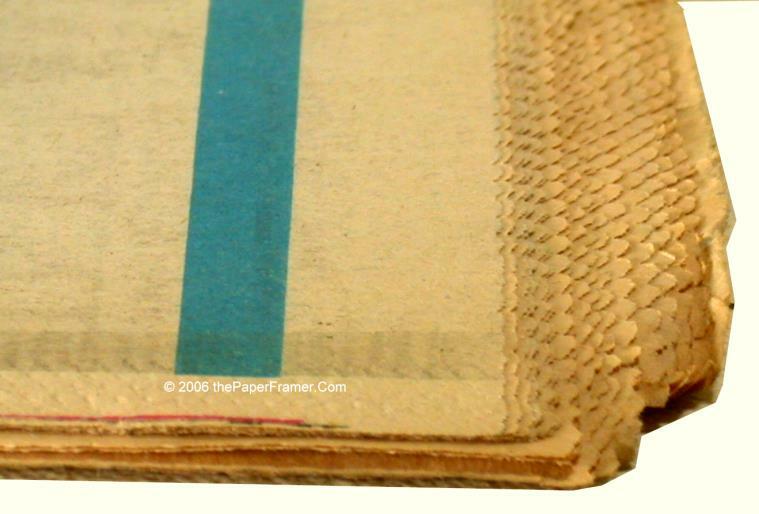 You can also choose the conservation upgrade for Value Frames to protect your newspaper. You can read more on conservation for Value Frames here . Newspaper Sizes. There are two popular newspaper formats, or sizes. These are the Broadsheet and the Tabloid formats. 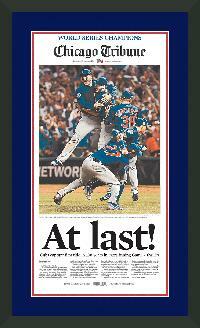 For framing, I will also discuss a third size, the Half-Broadsheet size. These are discussed below. United inches. 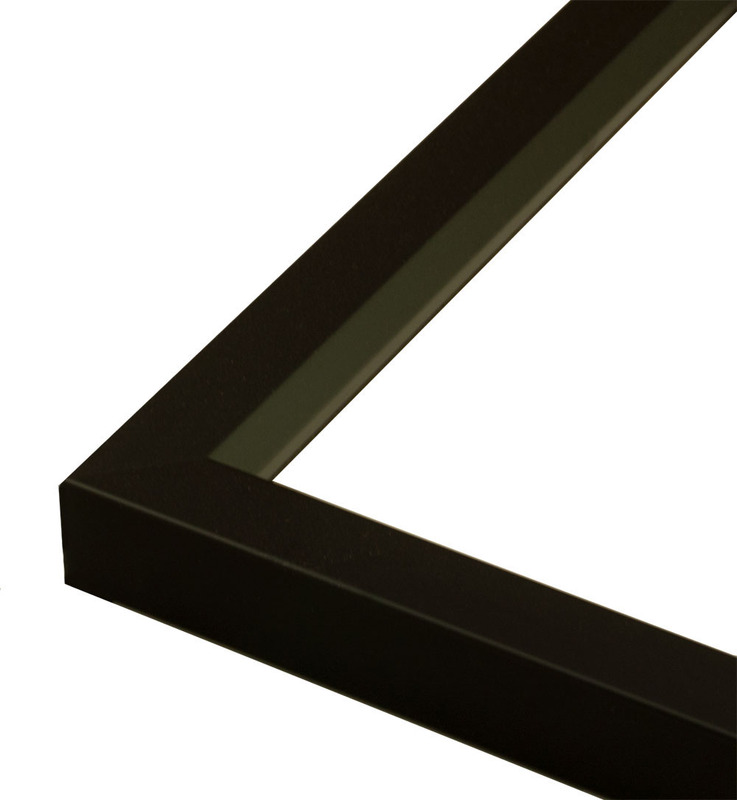 United Inches (UI) is a framing term that is used to determine the size and price of your frame. The UI for a frame is the width plus the length of the item to be framed. For the USA Today mentioned bewlow, the UI is 34 1/2 UI (12 1/2 + 22). When you choose your frame, you will choose the range that your item falls within. The 34 1/2 UI USA Today would require a frame size of 34 - 35 15/16 UI. Broadsheet Format. 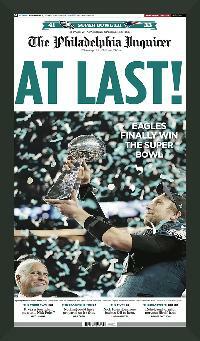 The broadsheet is a size and format for newspapers that use that format rather than the smaller tabloid size. 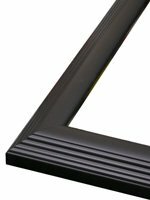 There are no real standard physical sizes, so be sure to measure your newspaper careully when ordering your frame. The width can be as little as 11.5" and as wide as 17". The height is generally around 22". The New York Times is about 12" x 22". Current USA Today's are around 12 1/2 x 22". Broadsheets are generally folded in half. Most broadsheets will be in the 34-35 15/16 UI size for framing. 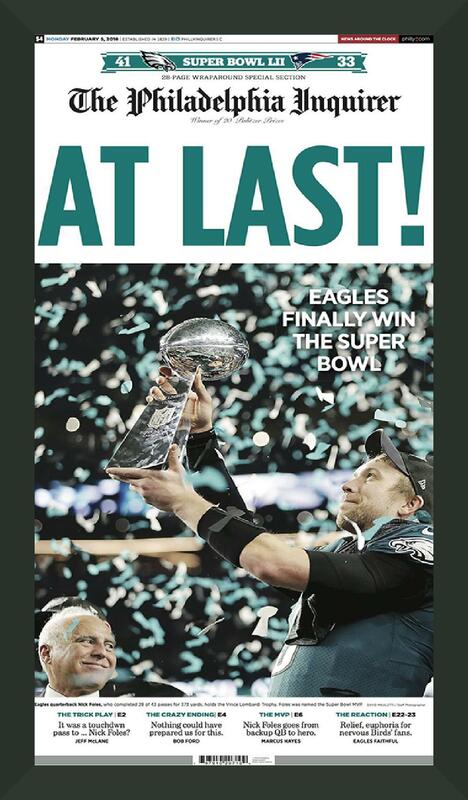 Tabloid Format. The Tabloid format is generally half the size of a broadsheet and is not folded. The width of most tabloids range from 10-12" wide and 14-18" high. 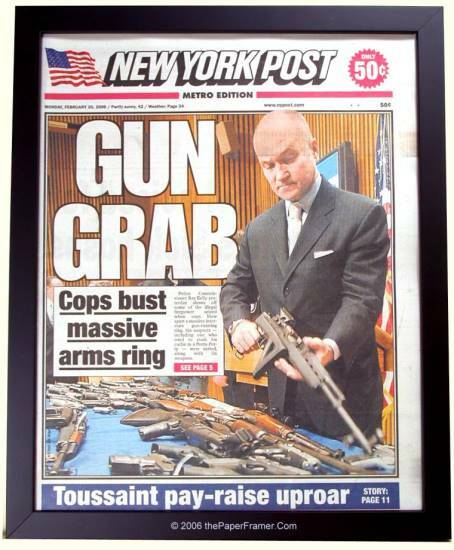 The New York Post shown is 11 1/4" x 14 1/8" or 25 3/8 UI. Most tabloids fall in the 24 - 25 15/16 UI size. Half-Broadsheet Format. There is no such thing as the Half-Broadsheet format. 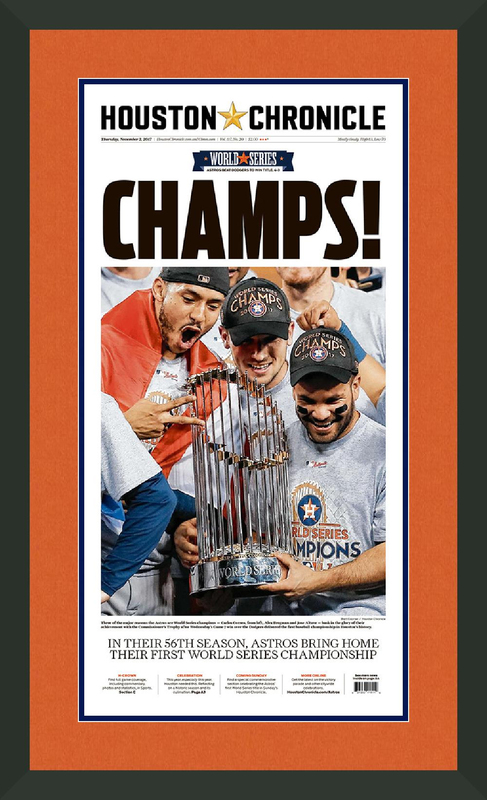 When framing a broadsheet, some people prefer only to frame the portion above the fold as shown to the right so for framing purposes, I am calling it a half-broadsheet size. The overall size will range from 12 1/2 to 17" wide and around 11" high. Most half-broadsheets will be in the 22 to 23 15/16 UI and 24 to 25 15/16 UI sizes. Measuring your newspaper. 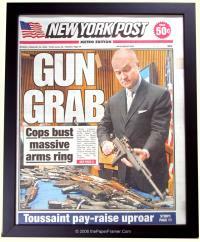 For framing, measuring your newspaper is more difficult than framing a magazine or comic. This is because the edges of most newspapers are uneven and overlapping. 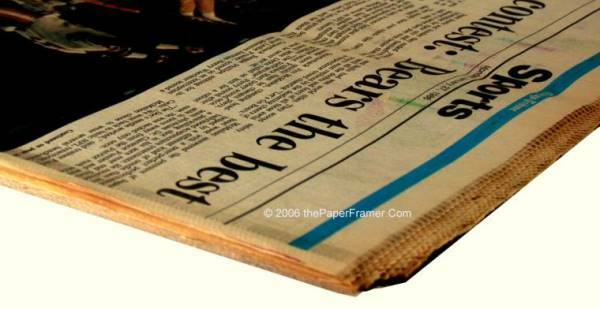 The image at right shows the edges of a typically newspaper. 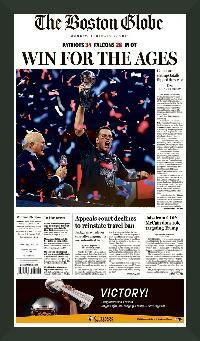 The overlapping of the pages can be as much as 1/2" on some newspapers. If you frame the entire newspaper to the right, portions of the edge will show if the newspaper is framed as it is. For a non valuable newspaper you should remove all but the cover page and refold the newspaper so that the edges are together and then measure the newspaper. If the newspaper is valueable, then consider changeable framing. Since the paper is encapsulated in a Mylar sleeve and matted, I can show (or cover) all or only part of the page. For the newspaper to the right, I would probably cover about 3/4" of all the edges, showing a nice, squared off front page. If you do this, then you also need to let me know the margins when you order.